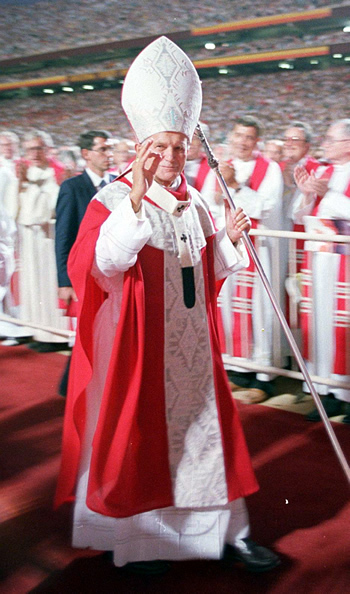 On September 14, 1987, I had the privilege to attend the Papal Mass of Pope St. John Paul II at Sun Devil Stadium along with my Mom and cousin. It was a glorious celebration and one that I remember to this day. I was 13 years old and really didn’t know much about the life of the Holy Father at the time. It wouldn’t be until six years later that I finally began to learn about Pope St. John Paul II. Since that time, I have studied, read, and written about Pope St. John Paul II. While on this side of heaven, he became one of my heroes. I was able to see him at World Youth Day 1993 in Denver, Colorado and then seven years later at World Youth Day 2000 in Rome, Italy. He has made such an influence in my life and I enjoy talking about him often with friends and people that I meet. 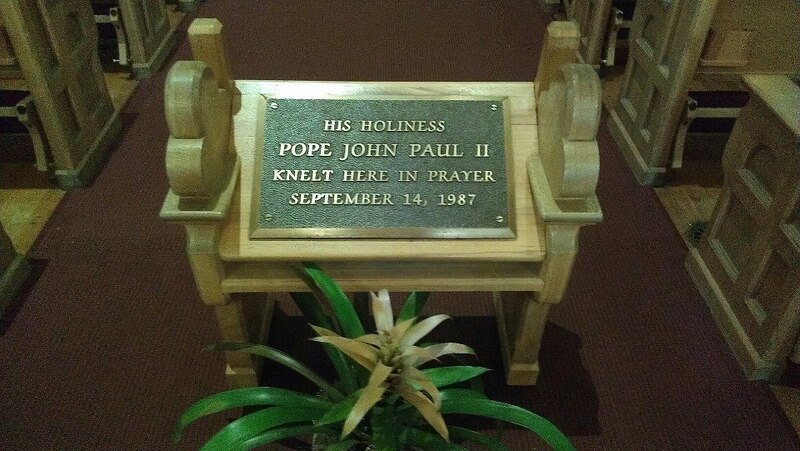 This past Friday, September 14, 2012, was the 25th Anniversary of his Papal Visit to Phoenix, Arizona. Come hell or high water, there was no way I was going to miss this Mass! 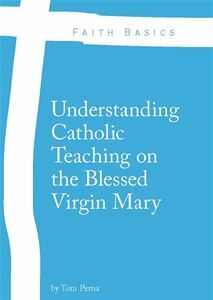 I went first for myself since Pope St. John Paul II still is a major impact in my life as a Catholic, and as someone who studies the faith academically and teaches it to others, he is an important figure in the Church today. His writings will impact the Catholic Church for centuries to come. I also went as a representative for my parish, Our Lady of Perpetual Help in Scottsdale. If you don’t know, I am now the Director of Stewardship and Advancement. It’s a fairly new position (only two weeks) that I have attained and so far, it’s been very rewarding, challenging, and fun. The two priests I work for are very orthodox and faithful to the teachings of the Catholic Church. It will be a real pleasure giving my loyalty and obedience to such men of God. The Mass this past Friday was at St. Mary’s Basilica in Phoenix, Arizona. Twenty-five years ago, Pope St. John Paul II knelt in this Basilica before going out to speak to the thousands of people gathered outside on the streets. The Holy Mass on Friday was celebrated by Bishop Thomas J. Olmsted of the Diocese of Phoenix along with his Auxiliary Bishop Eduardo A. Nevares, and former Bishop of Phoenix, Thomas J. O’Brien. There were many priests and deacons from around the diocese that came and joined the Bishop in celebrating this Jubilee Mass. 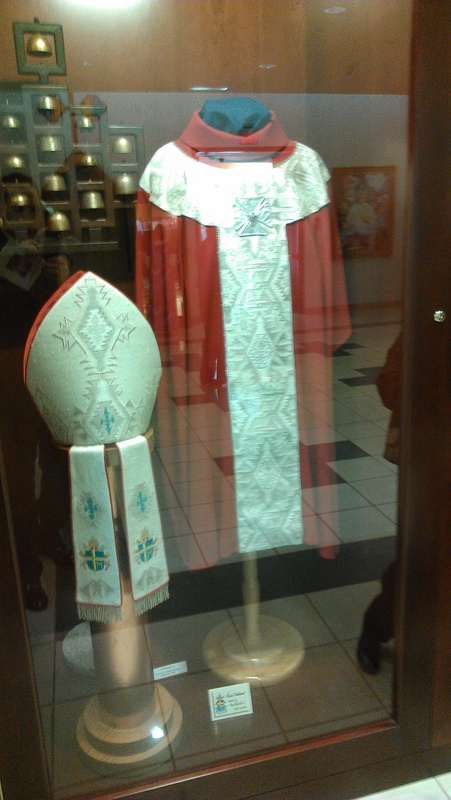 After Mass, there was a reception in the Diocesan Pastoral Center where many pictures and now relics were on display. It was a great day to be a Catholic in Phoenix and I was happy to attend.